As I mentioned when I reviewed Jack's How to Design and Build Your Garden Railroad, Jack Verducci's has been one of the premier writer for Garden Railways magazine for decades. Now that Garden Railways is making many of its past articles available online for subscribers, you can track much of this content down online. However, Kalmbach, publisher of Garden Railways and many other hobby magazines, believes that folks like having Jack's articles on related subjects under the same physical cover. In the case of How to Design and Build Your Garden Railroad, they were right - Amazon's supply of the book ran out almost immediately, although a few other vendors, including Kalmbach still have copies as of this writing - check our review on that book for details. At any rate, this book is not a single step-through "how-to" book, but it is a collection of Jack's best Garden Railways articles about structures, sorted into a sequence that makes sense for the beginning reader. Some of those articles would be hard to find elsewhere. Others cover topics - like adhesives - that you wouldn't necessarily know to look up, but are very nice to know. The first chapter isn't even about structures, per se; it's about which adhesives are best for each kind of building construction. Doesn't everybody who's every put together a model airplane know everything they need to know about this? Isn't the little tube of glue that they used to put in with the POLA models sufficient? The answer to both questions is "no." Models exposed to extremes of dampness and dryness, heat and cold, put a lot more strain on the glue than the POLA glue is really designed to handle. And you don't really want to use model airplane cement on plastic buildings unless you're a nut for the stuff and you can test it on a small surface or something first - plastic buildings are made of many different materials, and they don't always react the same way. Not that you have to own all the glues Jack recommends or follow his instructions implicitely - Jack works mostly in California, and doesn't see his buildings go through Midwestern dampness and coldness extremes. But his summary of what each kind of adhesive is good for is probably the best written for the hobby. The second chapter deals with tools that you need or at least would be nice to have on hand. Don't lose heart, most of the tools he describes are for people who are building their own wooden houses from scratch. But at least this gives you a reference in case you ever want to try such a project and someone recommends some obscure tool for a particular use. 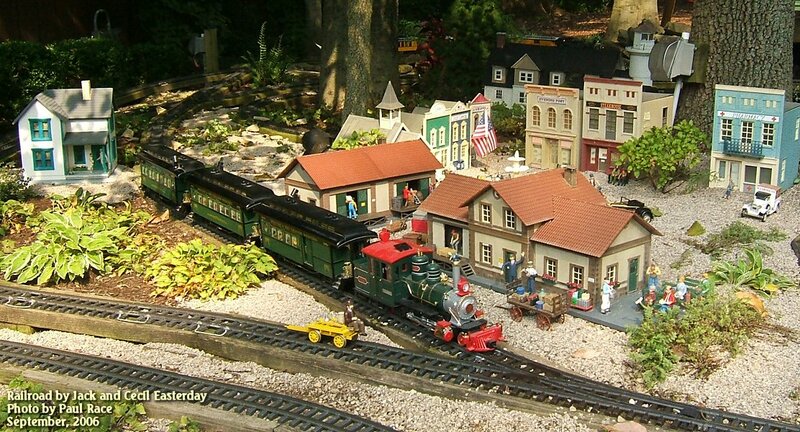 As of 2012, the vast majority of buildings you see on garden railroads are still built up from plastic kits. Jack's article on these is a brief but helpful introduction. Supplemented with another article in this book - "Painting for Protection and Finish," this will tell you most of what you need to know to have your plastic buildings go together, stay together, and stay attractive for years. As an aside, our own"Painting Plastic Structures" article goes into a lot of detail that Jack doesn't, but Jack includes information we don't provide, so this is not entirely redundant. I have seen many buildings built using Jack's instructions and am nearly always amazed at the creativity of the builders and the quality of the craftsmanship. If you have any interest in building your own buildings from scratch, these articles are not only a great source of ideas - they will save you from a great deal of frustration. There are also "general tips" buried in some of these articles - things that apply to more than just that particular topic. So every article is worth reading at least once. Finally, Jack has written several articles that might be considered either "miscellaneous" or "advanced" - ideas you may never use or find expecially helpful for certain projects. 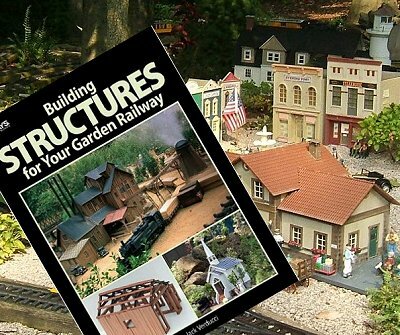 I'll be honest, I'm pretty sure that at least one of these articles - "Landscaping with Model Structures" is included in Jack's How to Design and Build Your Garden Railroad book. (I've lent my copy out so I can't be sure.) But the other articles have lots of ideas you may find useful. As I peruse the topics in this book, I can't help noticing that there are a number of web resources that touch on the same topics, even a few that go to more detail. As an example, some of the tips on the FamilyGardenTrains.com Structure page may be more useful to beginners or to people on a budget. In addition, some of these articles have been available online to Garden Railways subscribers. But, as much as I love the web, online availability of this information is no replacement for a single organized resource that you can take with you anywhere you go. In other words, this is a best single collection of garden railroad structure ideas every published in any form, and the attractive book format just makes the many great photos and tips that much more accessible. Frankly, if its tips help you significantly improve the appearance or extend the life-span of one $80 building kit, it will have paid for itself. Even more important, it's a lot easier to give a book like this as a Christmas, birthday, Father's day, Mother's Day or other present than it is to give a web site. And, showing Kalmbach that garden railroading is still alive and will may just encourage them to deliver more titles. For more books about garden railroading, please check out our Garden Railroading Books, Videos, and Magazines page.